Just as they did with their Andy Warhol x Incase iPhone 4S Cases, the deceased Pop Art and 60s cultural icon’s art makes its way into modernity yet again. 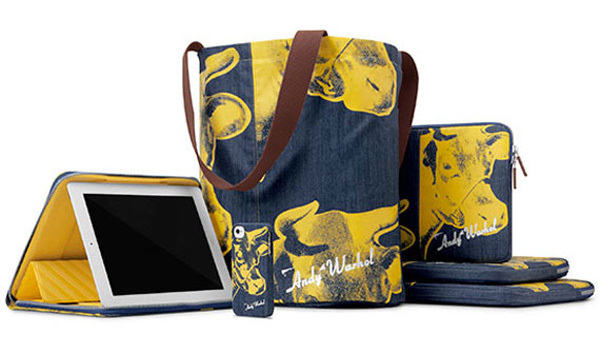 A new slew of tote bags and cases for the iPhone 4S, iPad and Macbook Pro were released as part of the Incase for Andy Warhol Collection. The latest of the collaboration commodifies Warhol’s Cow Wallpaper (1966) and So Many Stars (1958) prints alongside imagery from the artist’s 1966 film Chelsea Girls and a self-portrait from the Photobooth series. The products range in price from $40 USD to $130 USD, and are now available online at Incase.